"Melt in your mouth. My mother-in-law actually asked for this recipe... now THAT'S saying something." The topping was yummy, but the cake itself wasn't great. It was almost too sour tasting and leaves a funny aftertaste. Definitely do not recommend this and will never make again. 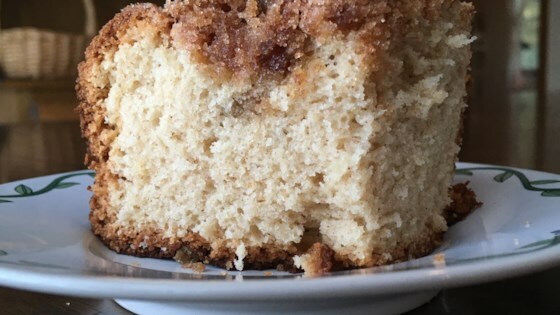 First time coffee cake... simple recipe and delicious. Then I made it again and used almond instead of vanilla and it was a smash. This is a great recipe. Can't miss... follow the directions. Very tasty made in a bundt pan with the topping in the middle. I dusted it with powdered sugar...very attractive!